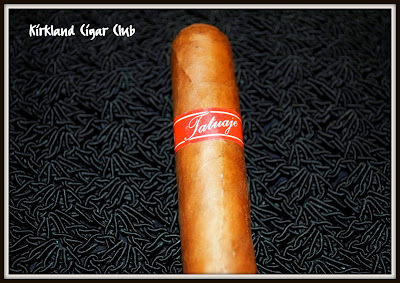 I stopped by the Tobacco Patch on Friday night, they were having a "Cigar Tasting" - Villiger 1888 Cigars. The Rep had a few open boxes on the countertop displaying all the different sizes, so I checked them out. Villiger cigars are good looking cigars. I picked out 3 different sizes and they gave me one for free. I’m a sucker for anything that looks like a good deal. Speaking of good deals, I got one of these for free the week before when the store first got them in, my tobacco-man pulled out a sampler box from behind the counter and gave me one to try. So here it is Sunday night and I’ve had an opportunity to try 3 different sizes of the 1888 cigar line over the course of the week. Honestly, I liked them all. The first one I tried the weekend before and I was really impressed with how nice a smoke it was. Friday night at the tasting I smoked my second one and again an excellent smoke - perfect burn, smooth tasting, wrapped almost to perfection (if you take a close look at the top photo, you’ll see a little peeling away of the wrapper towards the top, still burned perfectly though), and today while I was down at the Kirkland Marina (Hi Mark) I smoked this Robusto. I’m really happy with this line, excellent mild to medium cigar, definitely not too strong of a cigar for my taste, and taste it has! I like to compare cigars sometimes and I'd have to rate this almost on the same scale as a Cohiba, so of course you can see how much I liked it, plus it's considerably cheaper in price. Yes! Are cigars getting better these days? Sure seems like it, or maybe I'm just getting lucky in what I pick out. Busy day! Started off with our four mile walk - we've got a little course that goes from our house down to Kid Valley, back through downtown Kirkland and then up the hill to the house. It's how we start our weekend mornings. When we got back we both started working in the yard, I needed to pressure wash the decks and the patio behind the house and my lovely wife got stuck weeding. (I think I got the better of the two jobs!) When we finally finished more than three hours later, we were kind of beat and hungry, so we drove down to Starbucks for coffee and something to munch on. Without a doubt the Houghton Starbucks is the best Starbucks I've ever been to. For some unknown reason the coffee (Mocha) there is better than any other Starbucks. I asked the gals behind the counter how come their coffee taste so much better? They laughed, but appreciated the compliment. So after coffee and a few other little odd ball things that we had to do, we went back down to the waterfront just to stroll along the lake. It was a pretty nice day, hazy, but temperature was in the mid 60's (finally). After we'd walked for a while my wife said that she was going to go into one of the clothing stores and have a look around. Well, since my wife never goes into a clothing store for less than 15 minutes, I thought it was a perfect time to lite up this Tatuaje that I had brought along with me. She went in the store and I stayed out in front and lit up my cigar. First puffs were not the greatest. Pretty harsh right at first and the taste left in mouth was bad, but I gave it a little time to mellow out and as time went by the cigar that was so strong when I first lit it, really developed into a fine afternoon smoke. I've smoked this brand before and they've always been just on the edge of being too strong for me, but this one I really liked. I'm starting to wonder if my taste for cigars is changing? It seems like I'm leaning more towards the medium to full-bodied cigars now? Interesting. My wife came out of the store (no extra bags - Neat-O!) and we decided to walk down to the marina where I'd finish my cigar. We walked out on the dock and checked out all the boats. My neighbor Dave was down there in his boat with his son and a friend from out of town. We talked to him for a while and of course he asked when we were going to get together for a Scotch and cigar? (Soon Dave, soon...) So the whole time that we're talking to Dave, his son is goofing around on the dock with a water gun. The only problem was that he was filling it up from the lake - the distance from the dock to the water was pretty significant. So you probably already guessed what happened? Yep, he fell into the lake! Luckily he didn't panic and sink to the bottom. Dave and I immediately ran over and put out our hands to his son, he grabbed on and we pulled him out in one clean jerk. Poor kid, totally soaked with all his clothes on - guess he learned a little lesson today. We said our farewells and continued on our little walk. My cigar was down to the nub and I was enjoying it so much that I that I didn't want to put it out. Heck, any more and I think I would have needed a roach clip. When I first lit this up I would have never guessed that it would have turned out to be so good. I think I might just buy one of these again. I've had this cigar sitting in my humidor for awhile now and can't really remember why I bought it in the first place, I'm sure someone must have recommended it or something. Just looking at the wrapper I can pretty much tell that this is going to be a cigar with a PUNCH. The wrapper is unevenly dark in color and is speckled with little dark spots, you know the type of cigar I'm talking about, full-bodied, the kind that will make your head spin. I chose this cigar because we were on our way out to an Irish Pub and I knew that I'd have a big dinner and probably a few drinks. Well I was right, big dinner indeed and a couple pints of Paddy's finest ale. So after dinner we head back to Kirkland and stop by the Tobacco Patch so I can evaluate this cigar. First off, it's got a rustic kind of look and feel to it, not smooth at all, you can actually feel those dark spots on the wrapper. Also, the smell of the wrapper I didn't like as well, I couldn't quite place the smell though; ammonia? So I lite it up - Ugh! Somehow I knew there would be a bite. I puff away to get it fully lit. Yeah, this is pretty strong and it's taste is nothing to write home about. I know there are people that must love these, but not me. I smoke it about halfway down and my lovely wife says that she's ready to go, usually I would complain that we just arrived, but not tonight. Yep, I rarely do this, but tonight I threw this one out. It wasn't worth my time. Finally the sun has come out! Sometimes the weather up here is so miserable, in fact statistically speaking we have around 226 days a year of cloudy skies, not necessarily rainy days, but cloudy weather, which can really piss you off after awhile! We just love to complain about it - so why don't we move someplace nice and sunny? Surprisingly, most people that I know that have moved away, have moved back! No kidding! I'll ask them something like "why did you move back from sunny California?," and they'll say "We missed it here". Excuse me? There's something about the Pacific Northwest that draws you back, that's a fact. So last night I opened up the humidor and chose a Padilla Miami, it just happened to be on the top row and since I had a pretty big dinner I thought this cigar would top off the evening. My lovely wife and I headed downtown, stopped by Starbucks first, then proceeded over to the Tobacco Patch to meet up with the gang. Probably eight cigar aficionados out in front when we arrived smoking a variety of different cigars. You can always count on someone being there to strike up a conversation with, good group of people. So I pull out my cigar and lite it up, by the way these are not wrapped in cellophane. First impression, a little strong for my taste, but I've got my Starbucks Mocha should I need it. You know one of the cigar reps once told me that if you start to get a little light-headed when you're smoking a cigar, eat sugar! He explained the logic behind it, but I've long forgotten why this works. So the cigar's wrapper is a little dark, somewhat oily, not too much, and it's got a semi-soft feel to it, not as soft as an Oliva, but not as packed as the Magna I smoked a couple of weeks ago. It felt good in my hand and it delivered on the taste department. No bite, but just a tad stronger than I like. This cigar proved to be a good one, but I don't think I would have smoked this without a full stomach and something to drink while I smoked it. Overall I liked it. Now would I go out and buy a box? Well, maybe... There are times when I would love to smoke one of these, but in general it's not going to be one that I'll remember. Unfortunately. . .